This entry was posted in Analytical/Technical by terry2foot. Bookmark the permalink. Terry, thanks for another thoughtful post. The comments by Dan Mitchell are interesting. 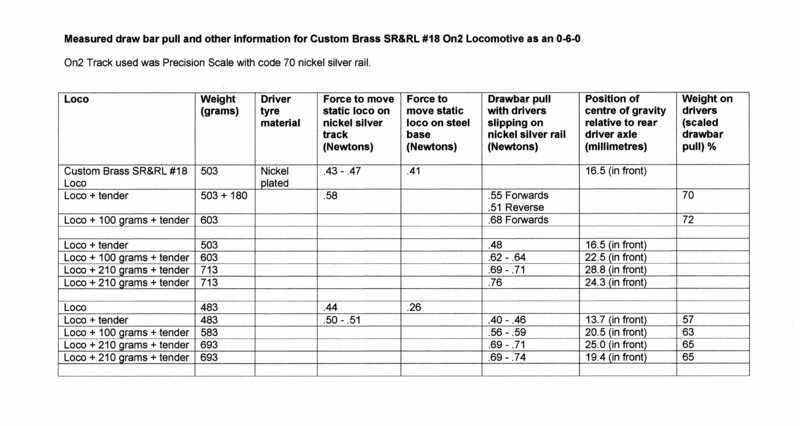 I would have thought our model locomotives were lighter than prototype locos. 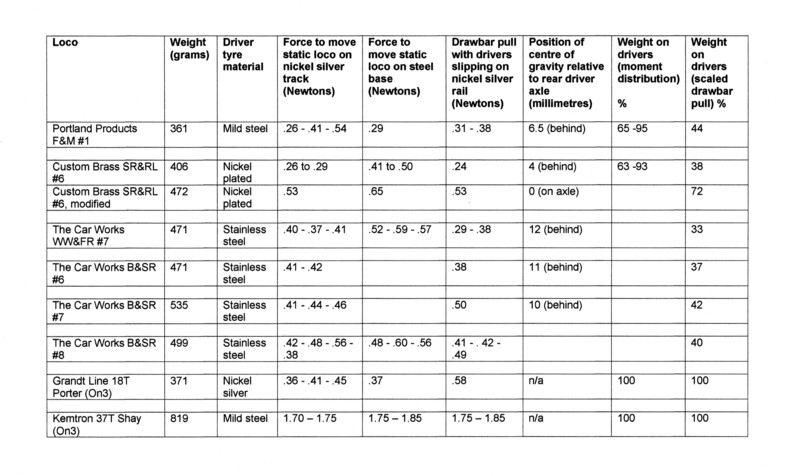 I would have thought brass was lighter than steel but a internet search proved me wrong. I would think that the space between motor and boiler in our models would have reduced weight and it does, but prototype locomotives have water which is not as heavy as our model weights. Thinking about it more, our model frames are probably thicker/heavier too. One area that the prototype has an advantage is equalization. Few of our models are equalized. Jeff Bissonnette has done wonderful work in HOn30 and Sn2 to equalize Forney’s. The pulling power of his mechanisms is greatly improved (as is the electrical connection). My modified CB SR&RL #6 does benefit from having the extra weight over, and in front of the drivers. The resultant position of the centre of gravity for this loco is directly over the rear driver axle. This position was not a modification aim – it’s just what happened with that stage of modification. The extra weight was added with simple hand tools from lead sheeting offcuts, ie no lathes or castings, to see what could be achieved. 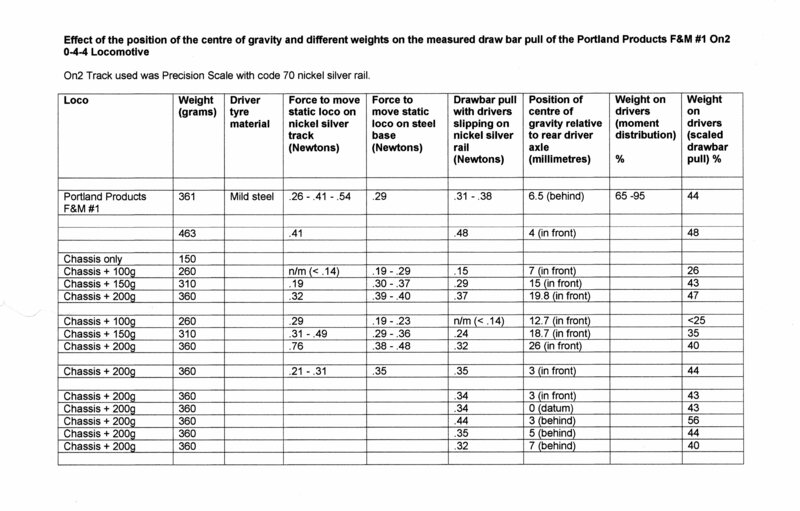 I have done a series of tests where I used external weights to simulate additional weight with different locations to give different centre of gravity positions for several On2 loco’s such as the Portland Products F&M #1, the Custom Brass SR&RL #6, The Car Works B&SR #8 and the Custom Brass SR&RL #18 tested as an 0-6-0. These have now been added to the main topic. Equalisation with three point suspension is definitely a benefit to any model railway vehicle, whether it is a locomotive, passenger car or freight car. 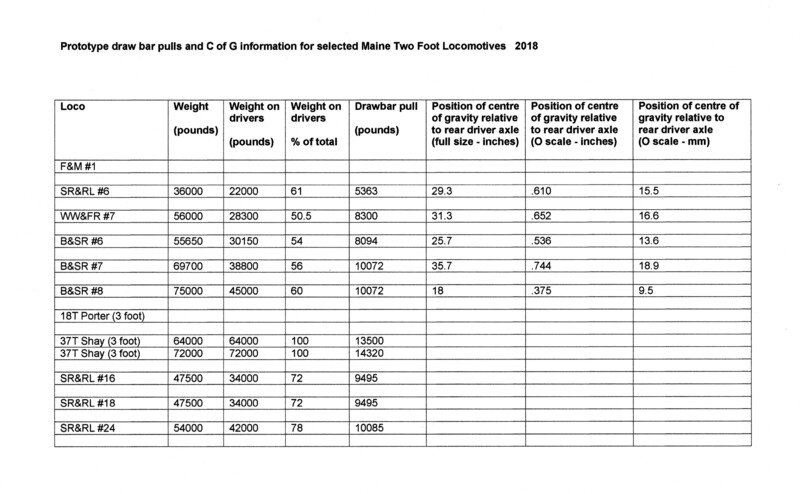 My On3 locomotives, built from kits, have this feature, and the benefit to their drawbar pulls can be seen in the published table where they are used as the examples of what is practically achievable with the different driver tyre materials. I am aware of the work that Jeff Bissonnette has done in a number of fields, but I do not have a web reference for him. His work deserves to be seen by a wider audience. Terry, thanks for adding the additional information. I’ll have to read it in more depth later. Jeff used to have a blog, but gave it up.